The Pure CF Engine on the YDP-163 delivers the Yamaha CFIIIS concert grand piano tone through its powerful 20W stereo amplifier. With 192- note polyphony, complex piano compositions can be played without dropped notes, and the sustained notes ring through faithfully. 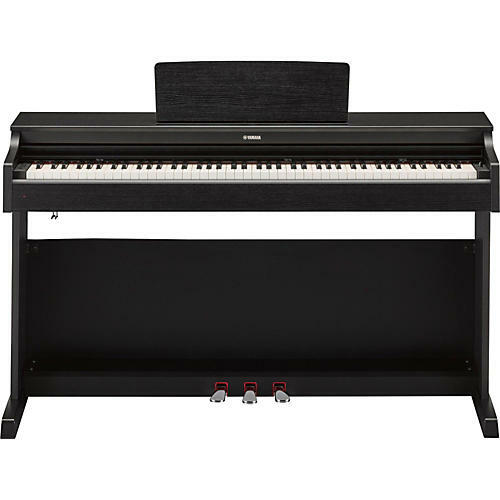 The YDP-163 has all of the convenience of an electric piano without sacrificing the performance of an acoustic piano. The Pure CF Sound Engine is the result of many years of piano-making expertise combined with state-of-the-art sampling technology. Yamaha is an industry leader in digital piano technology, and this is evident when listening to Yamaha digital pianos that use the Pure CF Sound Engine. The sound of the renowned Yamaha CFIIIS 9' concert grand piano is faithfully reproduced, allowing for incredible dynamics and expressiveness. The Yamaha digital piano is loaded with a variety of classic piano songs for your listening and learning pleasure. Players can use the accompanying book, "50 Greats for the Piano" to follow along with the music and learn how to play iconic pieces. They can also simply listen to the songs and enjoy these recognizable piano favorites. This feature is sure to add hours of enjoyment to this terrific instrument. Built-in speakers (2):	4.7 in. x 2.4 in.